Delmonico Steakhouse - One of the best Emeril Las Vegas Restaurants. Delmonicos - a Las Vegas restaurant by Emeril - is by far our favorite steakhouse for a number of reasons. The steaks melt in your mouth, along with the lobster. 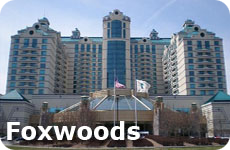 If you are looking for a great steakhouse experience this is it! The appetizers are incredible and I don't think we ever made it to dessert as we ate way too much for our main entrees. We usually share a steak and try many different sides and appetizers as they are all so good. 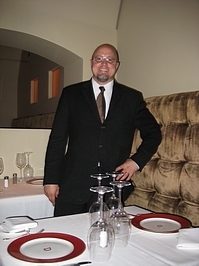 We always ask for Mark - our favorite waiter - as his service and team are impeccable. He is courteous and does everything to make our meal incredible. We first met him on Christmas eve of 2007. He made our meal spectacular and hasn't disappointed us in our subsequent visits. Ask for Mark when you go! 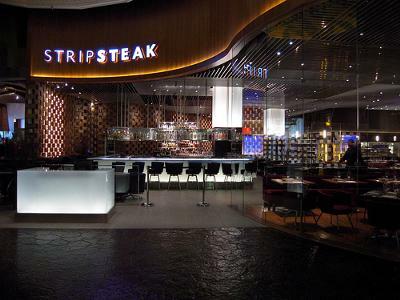 Food Style: Steakhouse and done by the famous chef Emeril! Pros: Food is excellent - staff is amazing! Location is great! Cons: Can be busy - make a reservation. Incredible chef Michael Mina. Kobe Beef (both Japanese and American Waygu), Fries cooked in Duck Fat (fantastic), and the best desserts in the world. Pricey - figure $100 pp before wine or cocktails. Warren and I also visited StripSteak with some friends in November of 2011. We had heard good things and decided to try it out after we couldn't figure out where else to go that was new to us. It really was very good. The service was great, the duck fat fries were incredible! We would recommend it if you are up this end of the strip! We also enjoy the off strip Steak House Del Frisco's.